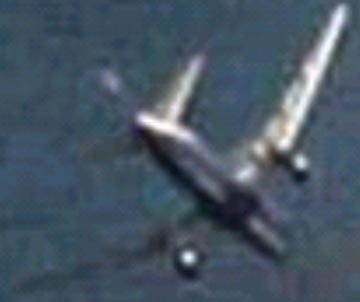 Of course, the biggest mystery of all is: What the hell is that on the underside of Flight 175? 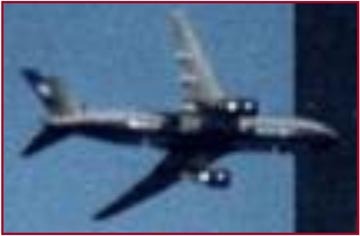 Like most people, what with the Shock and Awe of 9/11, we didn't notice these strange "bumps" as the film was played back to us time and again. Not till we looked at the stills of that frightening morning. In fact, not till La Vanguardia in Barcelona, Spain, published an investigation by Eduardo Martín de Pozuelo and Xavier Mas de Xaxàs last summer. We found this to be an important news story so we decided to translate its contents and slap it up on our web. And it's not any freak of photography, because where ever you look at it from, there always seems to be something there. The underbelly of a 767 should be smooth and, when the sun shines on it, it should show a straight line, not what seems to be two clearly distinct tube-like objects, as it does here. As part of its investigation, La Vanguardia sent the photos for digital image analysis (see Report in Spanish, or translation to English). The report is actually quite brief, you won't find a 30 page treatise for the simple reason that its findings are apparent to the naked eye: Something has been stuck onto the fuselage. When we first put up the translations of the La Vanguardia articles we were inundated with mail either saying that Logan airport would never allow a plane to go up with these strange objects attached (we agree), or demanding to know what they were. Obviously even the best digital analysis wouldn't be able to say what these objects contained. Guessing, I would say explosives. Only in Bruce Willis movies do aeroplanes blow up so spectacularly. 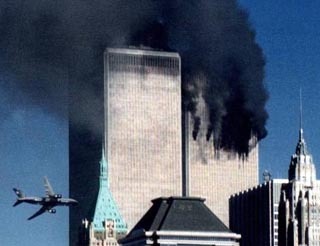 Certainly the first plane that crashed into the North Tower didn't create such a stupendous fireball. "Fine", I can hear you say, "but why put explosives on the exterior, when you could just as easily load them in the cargo bays, and nobody would be any the wiser". Well, dropping a bomb on someone's head is one thing, but making it go BANG is more complicated than that. You need a detonator. 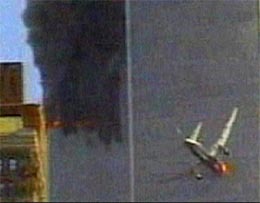 Yes, the plane would explode on impact, but objects in the interior would implode and likely burn up with the initial flames before the detonators had any chance to act. Strapped to the exterior, the charges would be blown away outwards with the initial explosion, leaving the detonators intact. So as not to slow down the loading of this page, we've put up one of the stills on a separate page and shown what it looks like through 11 different filters, accompanied by the report's conclusions. Click here to open in new window, it's well worth the look. 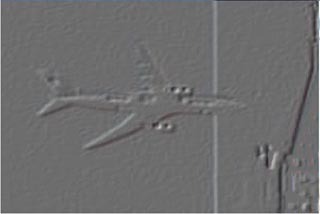 Until a proper investigation has the time to look into these photos, we'll leave you with some graphic work sent us by Mrs Rose Royce from Arkansas, giving a clearer impression of what these strange objects might be. 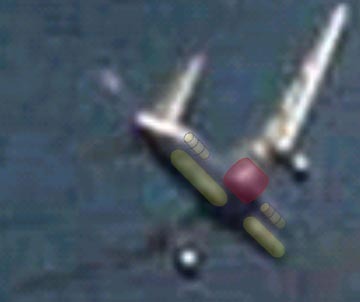 Furthermore, Rose also brings up an interesting point: the stills of Flight 175 also show that left engine has been somehow interfered with. The turbines should be parallel to one another and attached to the wings, below we see the left engine at a slight angle to the right turbine, and looking as if it was about to come away from the wing. According to Rose this would be necessary to counterbalance the large "bump" attached just to the right of the centre of the fuselage and to compensate for the resulting aerodynamic drag.